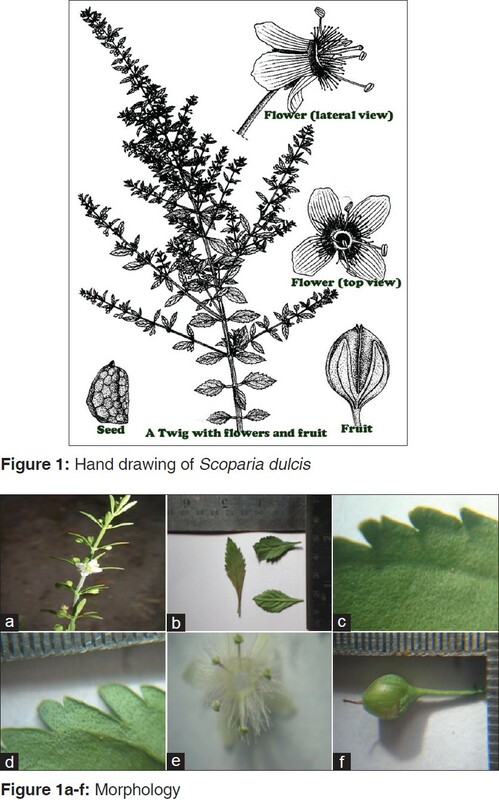 This manuscript covers a detailed pharmacognostic evaluation of Scoparia dulcis Linn. whole plant (Scrophulariaceae), including morphology, microscopy, physicochemical, and phytochemical screening. 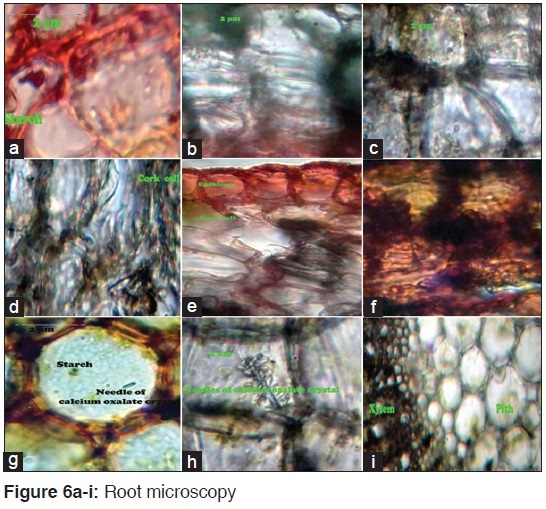 Microscopy of different plant part was done by performing transverse sections and longitudinal sections, which were identified by the different staining reagents and dyes. Physicochemical constants were done for whole plant; it includes ash value, extractive value and moisture content. Phytochemical screening was done for aqueous and methanolic extract in maceration and soxhletion, results revealed the presence of alkaloids, glycosides, carbohydrates, phenolic compound, flavonoids, saponins, proteins, and amino acids. These study includes parameters to establish the authenticity of S. dulcis and can possibly help to differentiate the drug from its other species. S. dulcis is an annual herb widely distributed in tropical and subtropical regions. In these regions, fresh or dried S. dulcis plants have traditionally been used as remedies for stomach troubles, hypertension, diabetes, bronchitis, and as analgesic and anti-pyretic agents. 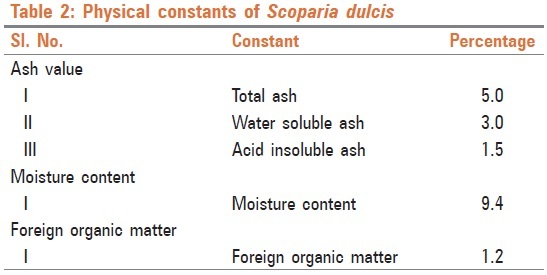 A number of different principles such as scoparic acid A, scoparic acid B, scopadulcic acid A and B, scopadulciol, and scopadulin have been shown to contribute to the observed medicinal effect of the plant. These compounds were found to possess various biological activities such as inhibition of herpes simplex virus replication, gastric H+, K+-ATPase activation, antitumor activity, etc. In a study of the anti-diabetic effect of S. dulcis, a glycoside named ammelin was obtained from fresh plants, which relieved other ailments accompanying diabetes, such as pyorrhea, eye troubles, joint pain, susceptibility to cold, etc., within a very short period of time. In spite of the numerous medicinal uses attributed to this plant, pharmacognostical information about this plant has not yet published. The plants were collected from local area of Barpali, Dist-Bargarh, Odisha during November 2009 to January 2010. It were dried under shade and made into a coarse powder by mechanical process and stored in air tight container for further studies. The plant was authenticated as S. dulcis Linn. by Botanical Survey of India, Central National Herbarium Howrah, Kolkata, India (Ref. No: CNH/I-I/38/2009/Tech II/137). An authentic voucher specimen was deposited in the Herbarium Museum, Department of Pharmacognosy, The Pharmaceutical College, Barpali. Morphological characteristics are referred to the evaluation of herbs by color, odor, taste, size, shape, and special features like touch, texture, etc., It is a technique of qualitative evaluation based on the study of morphological and sensory profiles of herbs. 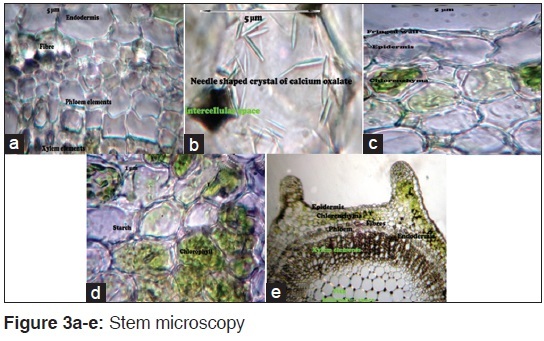 The microscopy of S. dulcis plant was carried out using digital microscope attached with computer system (Besto-1688). The plant parts were sliced fine by using microtome for its transverse section and longitudinal section; the finest sections were selected for the study. The transverse section was stained with phloroglucinol and HCl for staining the lignified tissues and mounted with glycerin and observed under microscope. The sections were examined under microscope using ×10 eye piece and objective pieces 10, 40, and ×100. For leaf constants ×5 eye piece and ×10 objective piece were used. The main importance of these values lies in identifying the species, whether the powder is authentic or adulterated. Three to four cut portions of the leaf from the central region of lamina of 6 sq. mm size were boiled in methanol in a test tube. Each of these portions was kept on a slide in methanol with lower portion facing upward so that veins were prominent on the lower surface and a small drop of glycerin was added. 5× eye piece and power objective 10× were used. Stage micrometer was focused and camera Lucida was fixed. A black sheet was placed on the side of the microscope where camera Lucida was fixed. Then using a stage micrometer 1 mm square was drawn. Image of the leaf was super-imposed on the square on the black sheet. Vein-islet and vein-termination were traced and counted. The vein-islet and vein-termination, including those intersected by the bottom and left side of the square were included but those intersected by the top and right side were excluded. Six such groups were counted. The leaf was peeled in such a way that both the upper and lower epidermis were separated. The peeled leaf part was taken in a test tube containing about 5 ml of methanol and heated on a water bath until the fragments were rendered transparent. Then the piece was taken on to a watch glass, to this a few drops of ethanol was added and washed with water. It was then stained with few drops of safranin, washed immediately with water and mounted with the help of glycerin. Microscopy of the stained piece was done by using compound microscope (5x + 10x), equipped with a camera Lucida. The epidermal cells and stomata were drawn on the black sheet and counted within the 1 mm square. The cells and stomata in more than half portion outside the square were not counted. Small pieces of leaves of the lamina were taken and boiled in methanol until the leaf pieces became transparent. Then by using camera Lucida, four adjacent cells of upper epidermis were traced. Then focused (×10) on the palisade layer and traced off the palisade cells beneath the four epidermal cells which were already traced. The palisade cells which were 50% more on the inside of the epidermal walls were also traced. Six such determinations were done. Physicochemical constants, such as the percentage of total ash, water soluble ash, acid-insoluble ash, moisture content (on the basis of dry weight), water and alcohol soluble extractives were determined. Extraction was carried out by two methods maceration and soxhlet extraction. 500 g of the shade dried coarse powder of plant of S. dulcis whole plant was macerated with 1.5 l of methanol and water separately and was kept at room temperature for 5 days. After 5 days, the solution was filtered and solvent was evaporated under reduced pressure, the residue was weighed and percentage of yield was calculated with reference to air-dried crude powdered materials. The extract (residue) was stored in a refrigerator for further study. 500 g of the shade dried coarsely powdered S. dulcis whole plant (500 g) was subjected to continuous hot extraction with methanol and water individually. The extracts were filtered, dried and percentage of yield was calculated with reference to crude air-dried powder. Morphological characteristics revealed, leaf was simple and pinnatified, green color having characteristic odor and sweet taste. Stem was woody, outer surface was rough, odor characteristic, taste sweet, color green and fracture irregular and fibrous. Fruit had smooth outer surface, green color, odor characteristic and taste astringent [Figure 1] and [Figure 1]a-f. The leaf of the plant, both upper and lower surface contained anomocytic stomata. It contained unique sessile glandular trichome [Figure 2]a-c. Stem contained starch grain and calcium oxalate crystals in cortex region. Its vascular bundle contains spiral vessel, tracheid, fiber, etc., The epidermis of stem had uniseriate, multicellular, glandular trichomses [Figure 3]a-e and [Figure 4]a-f. The root showed the presence of periderm containing brownish matter. The phellogen shows two rows of cells encircling the single layer of phelloderm. The cortex consisted of 4-6 layers of tangentially oblong and radially compressed parenchyma cells. Some of the parenchyma cells contained starch grains. The phloem consisted of sieve elements and companion cells. 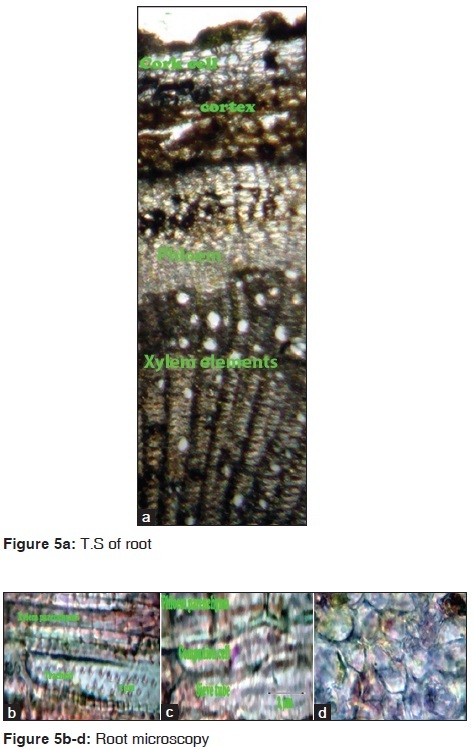 The xylem was lignified and consists of xylem elements such as parenchyma and trachieds. Cambium separates the xylem and phloem region. Medullary rays in the phloem region are non-lignified whereas lignified in the xylem region [Figure 5]a-d and [Figure 6]a-i. Leaf constants like, vein-islet number, veinlet termination number, stomatal number, number of epidermal cells, stomatal index, and palisade ratio were monitored and tabulated [Table 1]. The finding showed range of vein-islet number was between 11.5 and 14.6, ranges of Veinlet termination number was between 16.1 and 20.4. The ranges of stomatal number was between 76 and 79 (upper surface) and 82-86 (lower surface), range of epidermal cells were between 477 and 532 (upper surface) and 435-491 (lower surface), stomatal index was 12.5 ± 2 (upper surface) and 14.3 ± 2 (lower surface) and ranges of palisade cells was between 6 and 9 [Table 1]. The plant showed total ash 5%, water soluble ash 3% and acid insoluble ash 1.5%. Its moisture content on dry weight basis was found to be 9.4% [Table 2]. The extractive value result had minor differences according to the extraction processes employed. Methanolic extract was found to be higher in maceration and Soxhlet apparatus extraction in comparison to water extracts [Table 3]. Preliminary phytochemical study found all the tested phytoconstituents in both extracts. The saponin test was found more prominent in water extract than in methanolic extract. 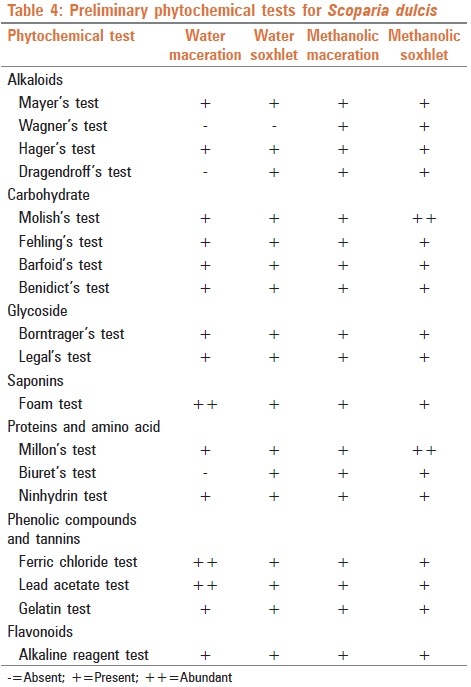 Phytochemical test suggested that S. dulcis has prominent phenolic and carbohydrate content as compared to other tested phytoconstituents [Table 4]. 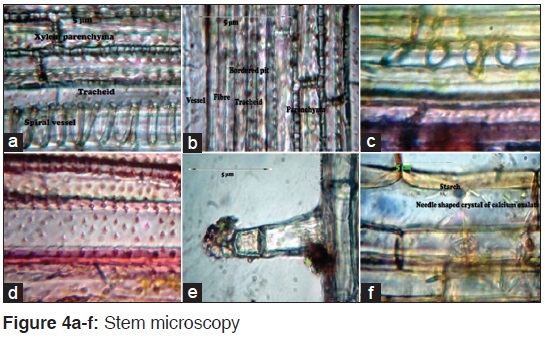 The macroscopy, microscopy, and study of physical constants of the plant S. dulcis Linn. were performed. The data found in these studies haven't been reported earlier. The pharmacognostical investigations provide this authentic data to evaluate this herb for its standardization and authentication in future. 1. Coee FG, Anderson GJ. Ethnobotany of the garifuna of eastern nicaragua. Econ Bot 1996;50:71-107. 2. Dennis PA. Herbal medicine among the miskito of eastern nicaragua. Econ Bot 1988;42:16-28. 3. 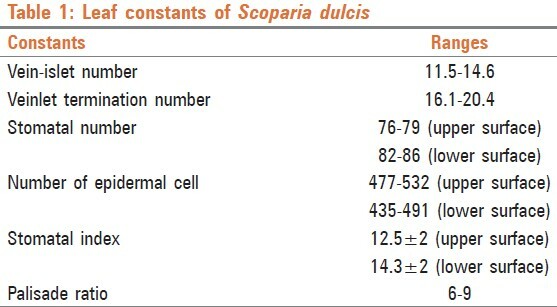 Satyanarayana K. Chemical examination of Scoparia dulcis (Linn): Part I. J. Indian Chem Soc 1969;46:765-6. 4. Orhue NE, Nwanze EA. Effect of Scoparia dulcis on Trypanosoma brucei induced alterations in serum transaminase, alkaline phosphatase and billirubin in the rabbit. J Med Sci 2004;4:194-7. 5. Chow SY, Chen SM, Yang CM, Hsu H. Pharmacological studies on Chinese herbs. 1. Hypotensive effects of 30 Chinese herbs. Taiwan Yi Xue Hui Za Zhi. J Formos Med Assoc 1974;73:729-39. 6. Perry LM, Metzger J. Medicinal Plants of East and Southeast Asia: Attributed Properties and Uses. Cambridge, MA: The MIT Press; 1980. 7. Gonzales Torres DM. Catalogue of Medicinal Plants (Food and Fixtures). Used in Paraguay: Asuncion; 1986. 8. Freire SMF, Emim AJS, Lapa AJ, Souccar C, Torres LMB. Analgesic and anti-inflammatory properties of Scoparia dulcis L. extract and glutinol in rodents. Phytother Res 1993;7:408-14. 9. Hayashi T, Kawasaki M, Miwa Y, Taga T, Morita N. Antiviral agents of plant origin. III. Scopadulin, a novel tetracyclic diterpene from Scoparia dulcis L. Chem Pharm Bull (Tokyo) 1990;38:945-7. 10. Nath MC. Investigations on the new antidiabetic principle (amellin) occurring in nature. Part I. Studies on some of its biochemical properties. Ann Biochem Exp Med 1943;3:55-62. 11. Latha M, Pari L. Effect of an aqueous extract of Scoparia dulcis on blood glucose, plasma insulin and some polyol pathway enzymes in experimental rat diabetes. Braz J Med Biol Res 2004;37:577-86. 12. Evans WC. Quantitative microscopy, trease and evans pharmacognosy. 15 th ed. New Delhi: Elsevier; 2005. p. 545-7. 13. Indian Pharmacopeia, Chemical tests and assays, 2 nd vol. New Delhi: Govt. of India Health and Family Welfare, The Controller of Publication; 1996. p. 105-8. 14. Kokate CK. Appendices-IV, Practical Pharmacognosy. 4 th ed. New Delhi: Vallabh Prakashan; 1994. p. 178. 15. Raman N. Qualitative phytochemical screening, Phytochemical Technique. New Delhi: New India publishing agency; 2006. p-19-22. 16. Khandelwal KR. Techniques and experiments, Practical Pharmacognosy. 13 th ed. Pune: Nirali Prakashan; 2005. p. 30-7.